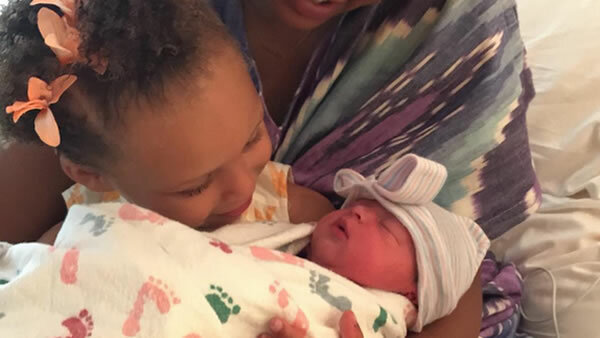 OAKLAND, Calif. (KGO) -- Golden State Warriors star Stephen Curry shared a photo of his newborn daughter, Ryan Carson Curry, on his Instagram page Tuesday. Curry said in the caption, "I'm wayyyyy up I feel Blessed! God is Great. Thanks to the doctors and staff at Alta Bates for taking care of my girls, especially Dr. Poddatori. Healthy baby and (Ayesha) is all I prayed for. #prouddaddy." Baby Ryan was born on Friday during a three-hour natural birth. Ayesha says that Riley has taken on her role of being a big sister beautifully.